Rain Room has been a bonanza for LACMA, its popularity prompting extended runs to accommodate the demand. After the hype, of course, comes the deluge after a brief wind-up in the waiting line. Admitted in small groups of 15 or so, patrons are led down a short corridor that opens up on the famous space itself, a large room illuminated by a single bright spotlight and dominated by a grid of falling water. Sensors detect the presence of people beneath the nozzles and switch them off accordingly. The experience, then, involves wandering through the grid surrounded by raining water while staying reasonably dry. There’s fun to be had daring the sensors to fail, and of course it’s a dream setting for artsy Instagrammers. But essentially, it’s a toy, not unlike splashing around a park fountain. It might be tempting to see in Rain Room an oblique commentary on California’s drought, but forget it: Rain Room is a content-less experience. No music. No supplemental imagery. Not even space for contemplation, as there are too many people bustling about. Whatever artistic aspirations one might want to uncover, they are overshadowed by that dreary and dreaded question: is it art? Ever since Marcel Duchamp obtained a urinal, flipped it upside down, cheekily named it The Fountain, and submitted it to the Society of Independent Artists for exhibition only for it to be hidden from view, the Art World has reacted to Dadaist acts of subversion by erasing their most fundamental provocation. The result is an unfortunate trend in contemporary art to define as art any “thing” that is placed in an art gallery. The critical problem is this: art that simply serves as a blank surface onto which viewers can project their own meanings is, in my view, scarcely worthy of being considered art. Ornamentation, perhaps, but not art. To that essential dialogue between artist, viewer, and the artwork itself there should be some communicable concept; the joy lies in fixing or loosening this concept, that is, in framing a work’s meaning. The meaning doesn’t have to be clearly articulated or overtly define. It can be vague, suggested, or even deferred in a post-modern gesture. (Whether it can be refused altogether is the Dadaist question, but Rain Room doesn’t manifest a Dadaist sensibility.) You can make it mean whatever you want, but the experience itself is just water falling from the ceiling in a darkened room. As with LACMA’s Levitated Mass, a rock perched above a walkway, Rain Room’s impression is of a gimmick who distinction is its artificiality. Make of that what you will, and decide for yourself whether it’s worth paying for a ticket. Tickets for Rain Room are $30 and must be purchased in advanced. A view inside del Toro's Bleak House. 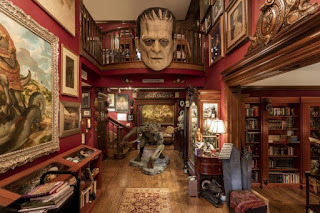 Designed to provide visitors with the impression of walking into Bleak House, del Toro’s Los Angeles Home, At Home with Monsters is a phantasmagorical exhibit well worth visiting. 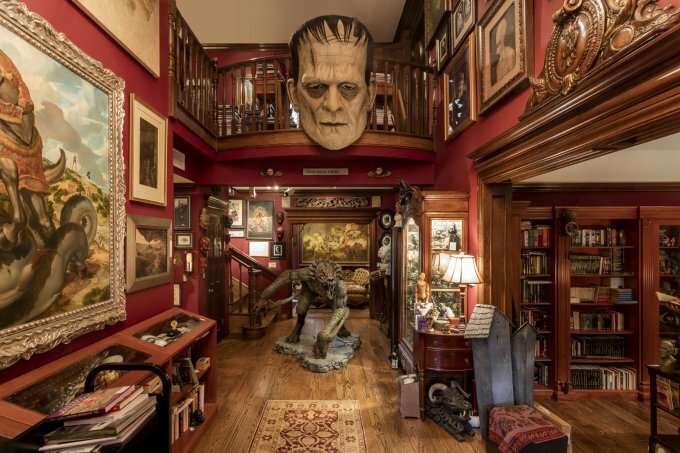 Much like LACMA’s Tim Burton exhibit some time ago, At Home with Monsters works to provide visitors with a richer context for the imagination of one of cinema’s most visionary artists. The salon-style exhibit is organized by theme, which makes the experience more personal than the usual didactic, chronological arrangement. But once exposed to the buffet of artefacts, however, curatorial concepts become less important than feeling of wonderment at the paintings, sketches, sculptures, books, maquettes, movie props, concept art and astonishing assortment of curios that span the mystical, the horrific, the beautiful, the macabre, and even the humourous. The crowd of visitors jostling for a closer look at the exhibit’s many curios can be jarring, but don’t let it deter you: the prospect of exploring the vast catalog of Del Toro’s inspiration should boost your courage for getting close and personal. From idea journals, displayed next to tablets allowing visitors to virtually scroll through the impressively illustrated diaries, to video monitors with film montages, the exhibit immerses us in the influences that drive Del Toro’s art. It particularly highlights the synthetic aspect of the artistic process, the convergence of artistic and cultural forces absorbed over a lifetime that produce singular visions. As with Burton’s exhibit, biographical insights emphasize how Del Toro’s outsider perspective and its embrace of the bizarre and freakish ultimately serves as an affirmation of humanity. 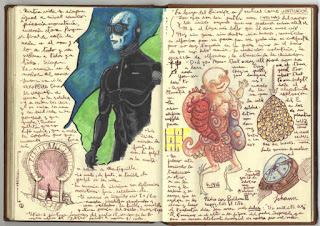 A page from one of del Toro's journal. A particularly refreshing aspect of the exhibit is its sheer lack of pretentiousness. Where we might ordinarily distinguish between high and low art, the sublime and the pulp, At Home with Monsters reminds us that the best art knows no class. And insofar as visitors leave inspired not only to look more deeply into life’s shadowy and creaking nooks and crannies but to embrace the creative impulse for themselves, then the exhibit triumphs as more than just a showcase for del Toro. Tickets are $25 and include general admission as well as admission to At Home with Monsters and other special exhibitions. While you're visiting LACMA, be sure to visit the contemporary Islamic Art exhibit in the Ahmanson Building as well as the Enigmatic Image, an exhibit on symbolism and other fascinating aspects of Indian art. Both are beautiful,fascinating and insightful.